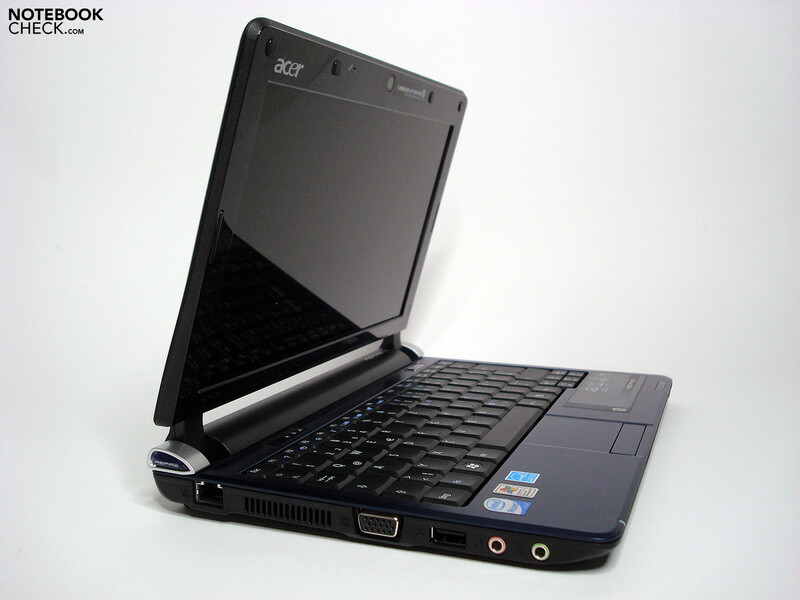 With the Aspire One A110/ A150, Acer has passed other Asus EeePC clones last year and reached the Netbook throne. It seems the Taiwanese company has found the right price-performance mix as they sold more and more items without any spectacular aspect and reached a market share of 37 %. 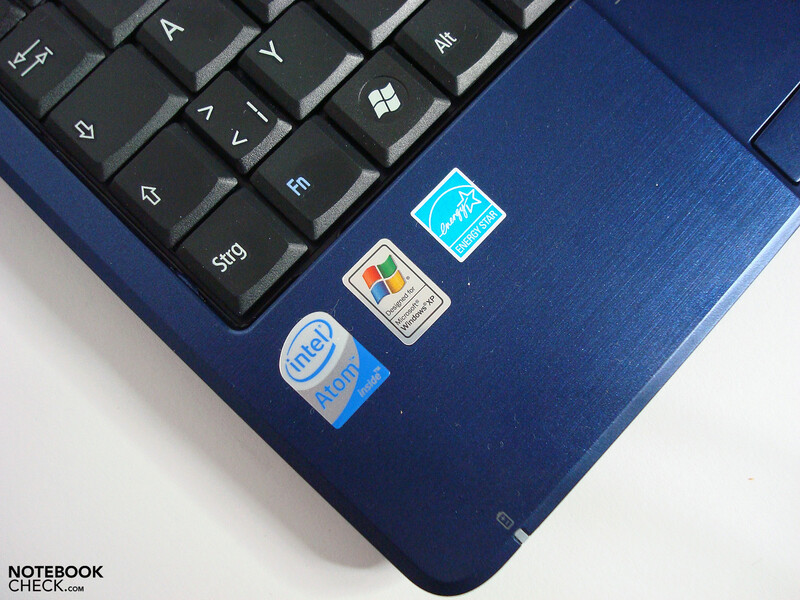 With new additions, the product mix covers a wide spectrum of Netbook segment. 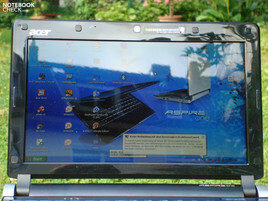 We had reviewed the immediate successors Aspire One D150 and Aspire One 531 and now focus on the Acer Aspire One D250. Our review shows the improvements built into the model and how it fares with competitors. Acer promises high reliability and availability of the Aspire One D250 on its Homepage, underlines the long battery life and a number of optional features. Currently only one preconfigured version is available at resellers with various case colors. 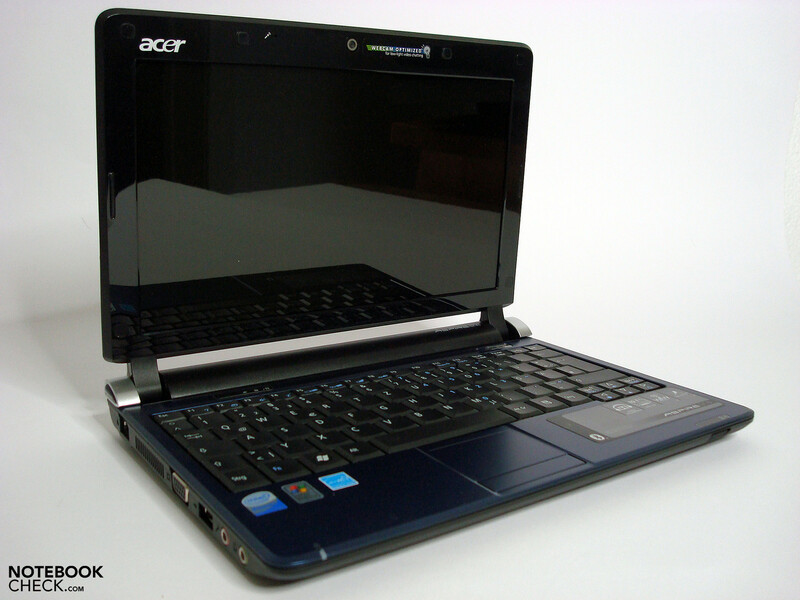 It has an Intel Atom N280 CPU, a 160GB harddisk and the mid range 6-cell, 48.8 Wh battery lasting for 6 hours. 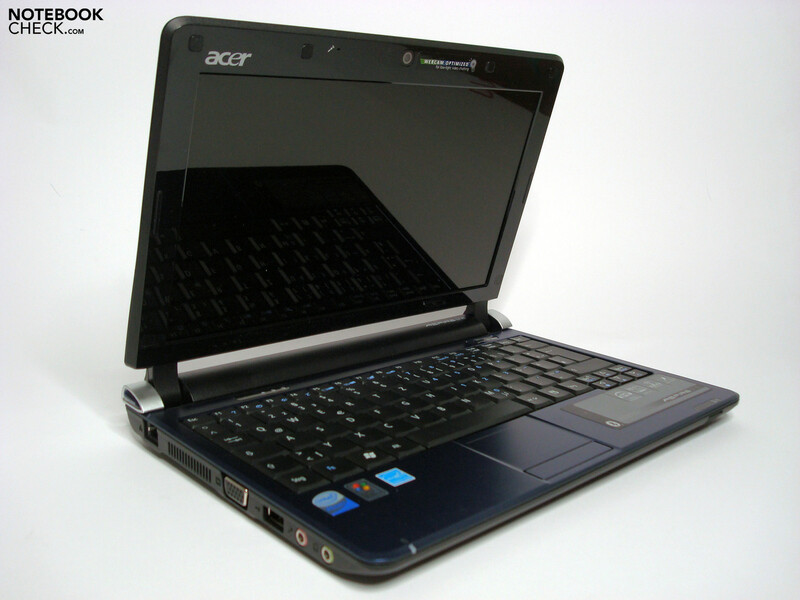 Our test model sent by Acer has an Intel Atom N270 CPU and a smaller 3-cell, 24Wh battery. As it is not available at resellers, it can serve as a rough guide for prospective buyers. White, Black, Blue and Red are the four available case colors and is one of the few areas where you can personalize your Aspire One D250. The high gloss look posterior of our blue review sample makes a good impression and is less sensitive than other glossy products. Fingerprints, stain and dust are not concealed for long on the display cover and require regular cleaning. 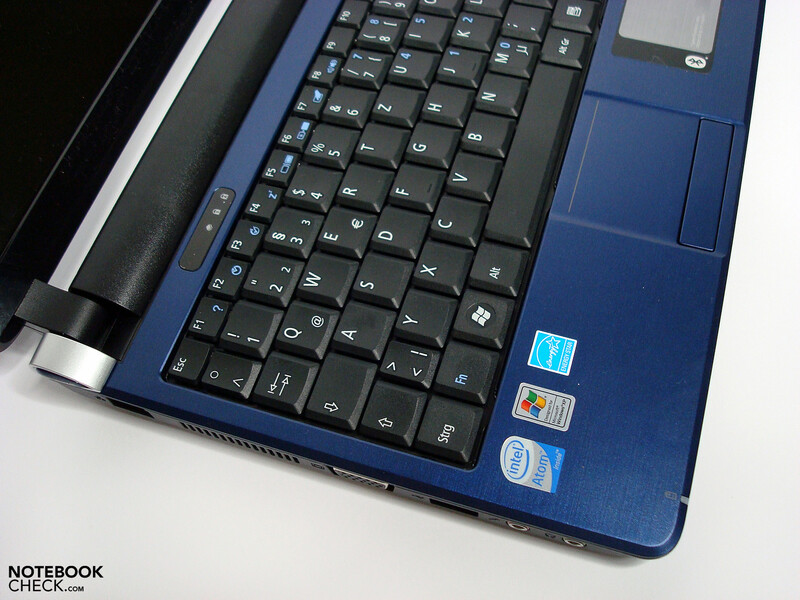 The workspace around the keyboard is also blue and has a pleasant matt brushed metal finish. The robust and solid case parts do not allow any distortions. Palm rest area and top cover are very solid. Keyboard, ports and switches are fitting fine, showing the high production quality. The only fault we could find in Aspire One D250 was a dust particle on the touchpad, we suspect it occurred during polishing. With time it causes discomfort, but does not effect its function and can be an individual case confined to our review sample. Both display hinges are big enough to hold the display firmly in place. Although not stiff, they do not allow adaption with single hand. In closed position upper and lower case parts do not require a display lock to hold their fixed positions. 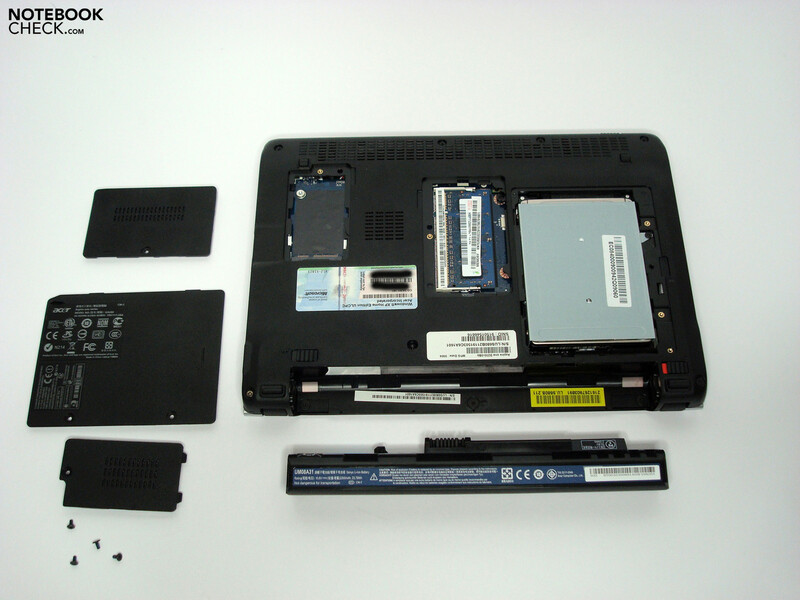 The Bottom of the case is made of black plastic and has three compartments which can easily be opened with one or two screws. The 3-Cell battery in our review sample fits tightly to the back of case and can be locked. The small battery constitutes a big proportion of the total weight of 1.07 kg. The 6-cell battery shipped with retail models increases the weight to around 1.3 kg, but it also offers increased runtime. The review model looks very thin and compact thanks to its case dimensions of 258.5 mm ( L ) x 184 mm ( W ) x 25.4 mm (H). 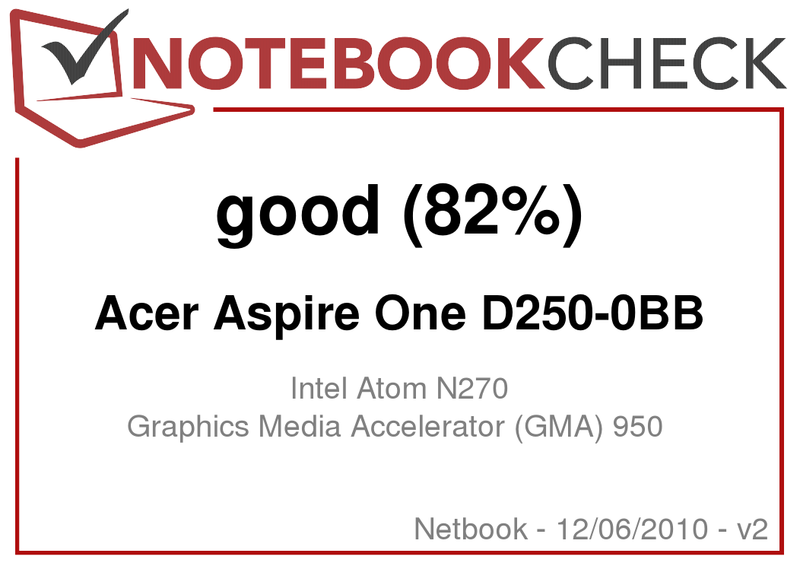 The Aspire One D250 has no surprises for us in connectivity. 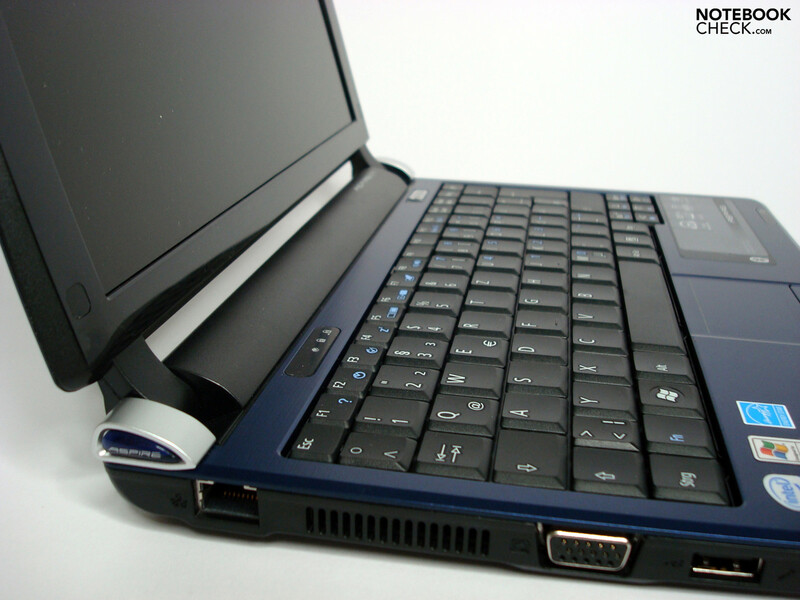 Three USB ports, LAN, W-LAN, Bluetooth, VGA output, 0.3 MP Webcam, card reader and audio ports (microphone input and speaker output) are standard and offer enough connectivity for Netbook applications. 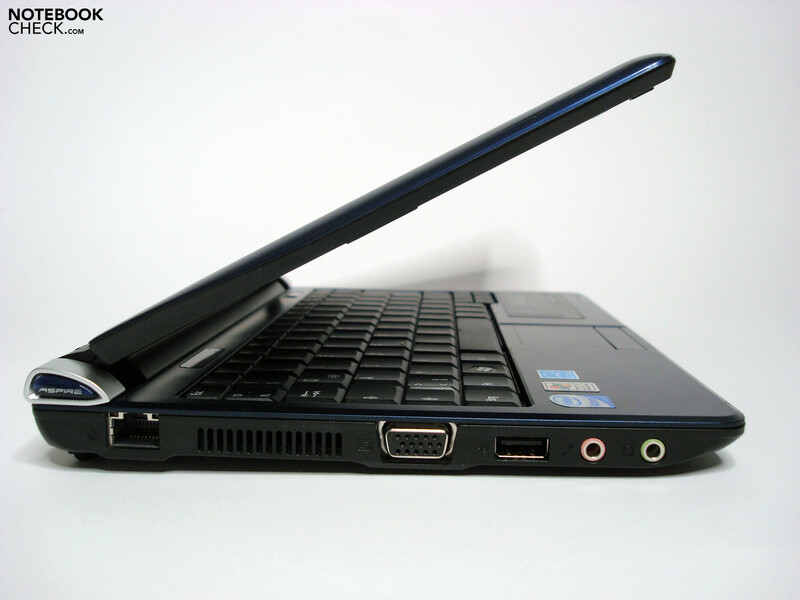 External USB hard disks, digital cameras and TV-sticks can be connected over USB ports, headsets or headphones over audio ports and as usual external displays are connected over analog VGA. 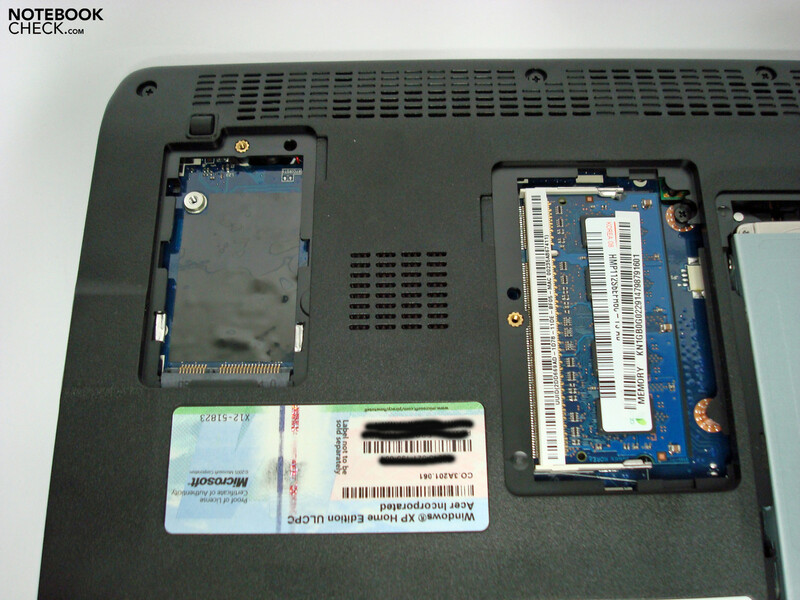 The additional SD-Card slot available on the Aspire One A110 was already removed from the Aspire One D150. The remaining multi-card reader covers with SD, MMC, xD, and MMS (Pro) card support a broad range of removable media. Even though there is a listed option and a SIM slot available, no version with UMTS Modem is currently available. Only the older Aspire One A150 is available with a 3G-connection and would not cost more with nearly identical configuration – and additional SD-Card slot and an 8.9'' display. While the number of ports are along the lines of its segment, from our point of view we find their positioning awkward. We find ports for network cable, power adapter and Kensington lock near the back and have no objections to them. 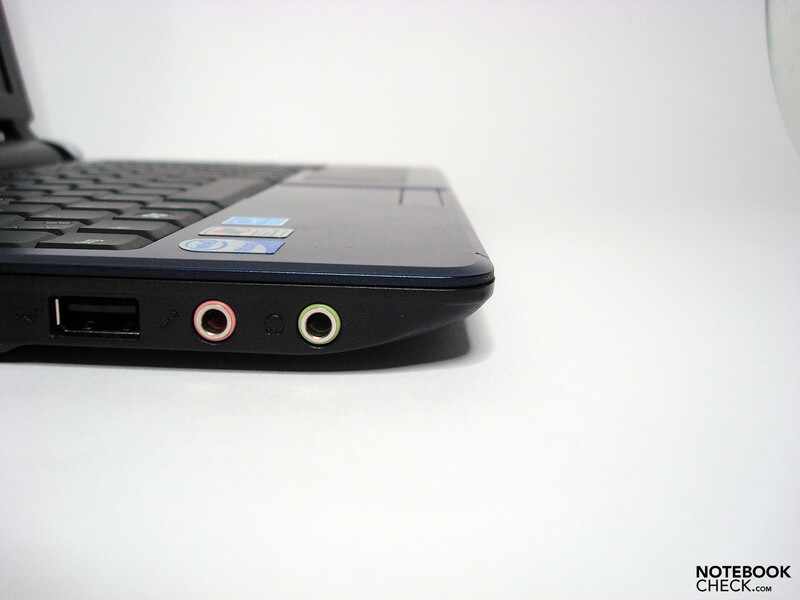 Audio ports for headphones and headsets are located at the left side which is unsuitable. If they were located in the front, they would be more useful for video calls, listening to music or watching movies and cable congestion on sides would have been reduced. The USB ports are located very close to the front and impose enough limitations when external devices are connected and make it very difficult to use all ports at the same time. On the right side USB cables with normal width connect side by side without problems. However, when a flash disk, TV receiver or UMTS Modem is connected, one of the ports is blocked and is no more usable. 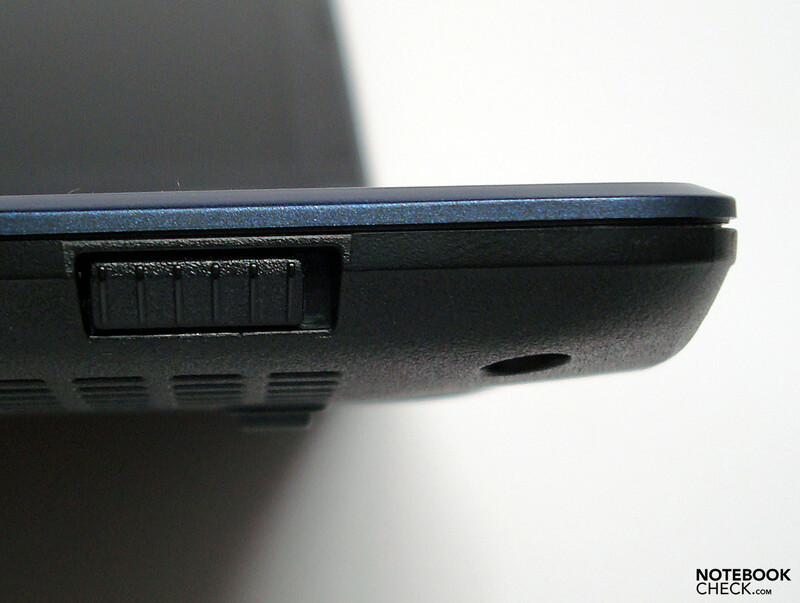 According to Acer, keys are 88% of standard key size and do not cover the whole of available case width. 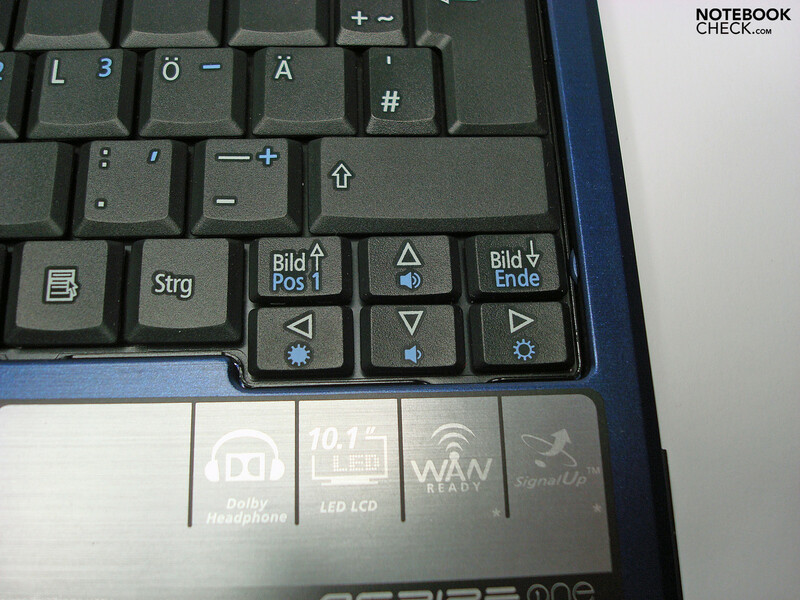 The reduced key size imposes the usual limitations, but after an adjustment period good typing results are achieved. It may be the last resort for people who write much and not very usable for long term usage, but the half length hub, good typing behavior and the pleasant sound make a good overall impression. The keyboard lays solid and can only be slightly bended by applying a strong pressure. Additional functions like brightness and volume adjustments can be set easily through FN combinations, as usual. The W-LAN switch is a welcome plus and allows setting the wireless modules on and off with ease. 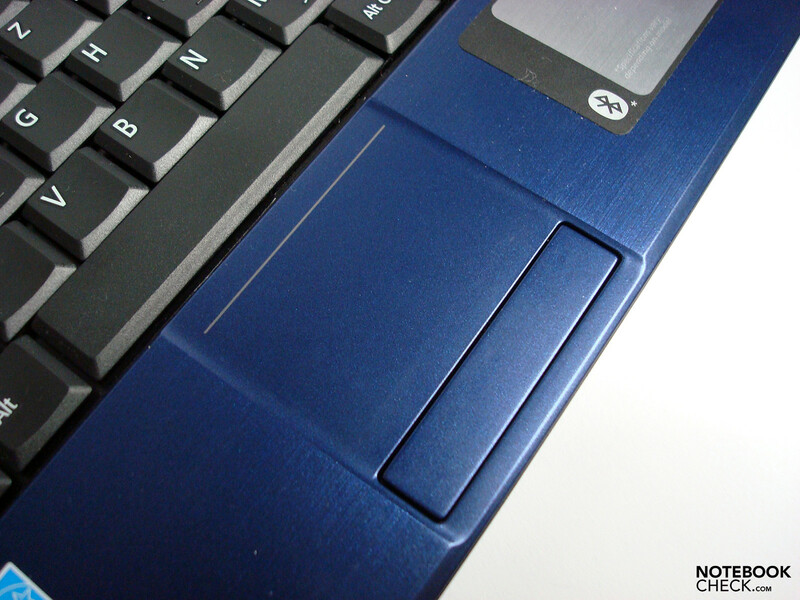 The Touchpad located in the palm rest area, has a good reaction and slide capability, however is limited by the small size. Especially the multi-touch functions hit the limit quickly and make you wish for a bigger area. 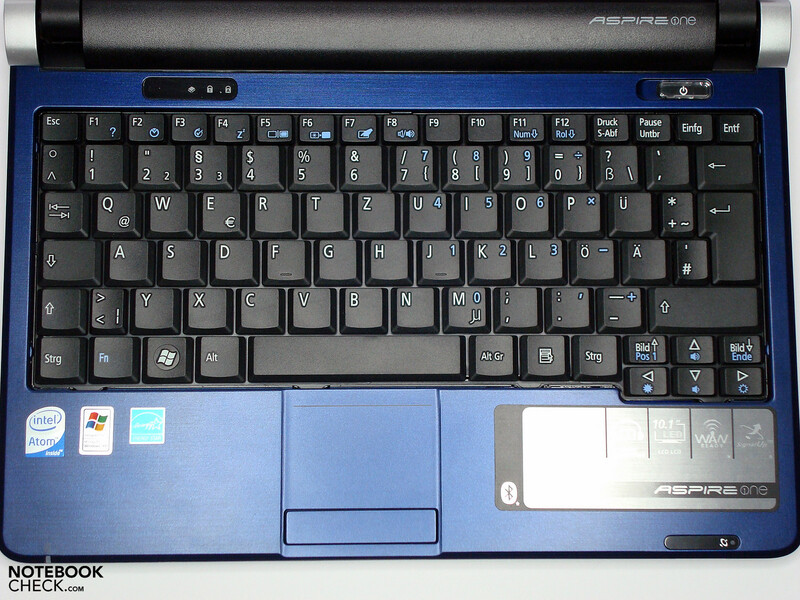 The Touchpad keys are compressed into a single key and to get accurate reaction one must press the outer edges. After a short adjustment period, it is possible to use it without any problems though. 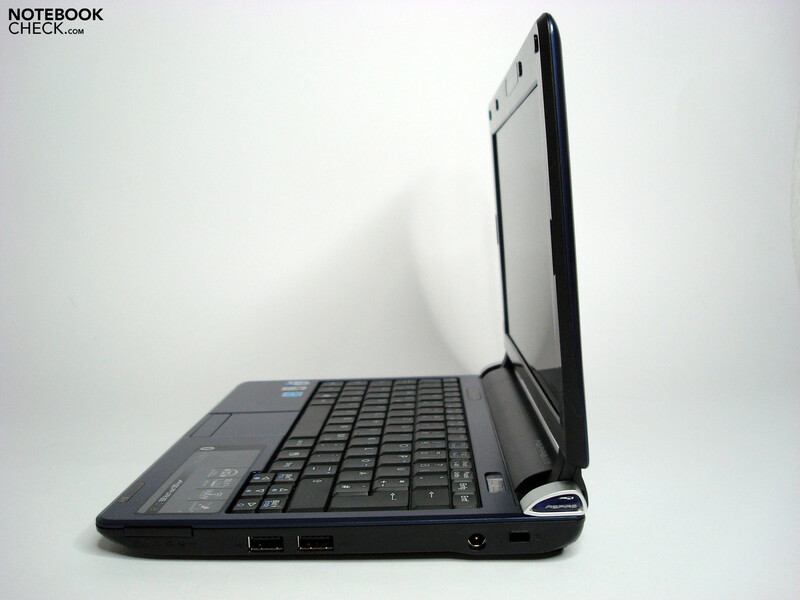 The 10.1” LED Display from SEC has the usual netbook WSVGA resolution of 1024x600 pixels in 16:10 format and has sufficient a display area. Acer labels its glare displays as Crystalbrite and gives an adorable brightness value of 200nit(cd/m2). 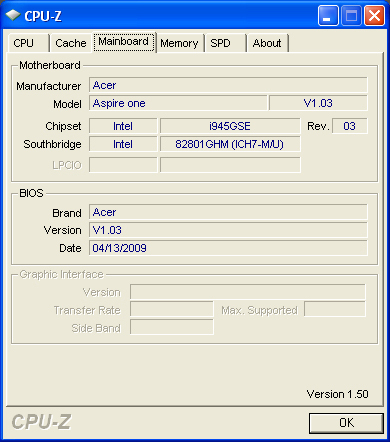 This value is 20 cd/m2 more than it was stated for the Aspire One D150 technical specification. With the maximum 214 cd/m2 in its center, it passes the manufacturer data and the average of 191 cd/m2 is slightly below the claimed value. But compared to the D150, for which we recorded 226.4 cd/m2 in average, the brightness values are actually lower. We think the highly reflective display surface delivering satisfactory results only in interior environment, is not suitable for its audience. Although the high brightness is capable of displaying recognizable content outdoors, it is masked by annoying reflections, so, requiring a high level of effort to separate them from the actual content. Therefore it is hardly suitable for real mobile work. Even in interior environments, finding a good position according to lighting is needed. The high brightness overcomes most of the reflections, but it is unable to cope with bright clothing and dark display content. Limited contrast ratio of 162:1 is not helping too. The colors are vibrant, but a grey-black is unappealing in photos or movies. The viewing angles are at class average and display content is recognizable wide away on horizontal level. Inverting or fading colors appear earlier, but should be enough for most applications in this level without any negative impact. Illumination is not on par with the standard LCD display level with 79%, but still can be classified as good and slight clouds are recognizable only in unicolor pictures. 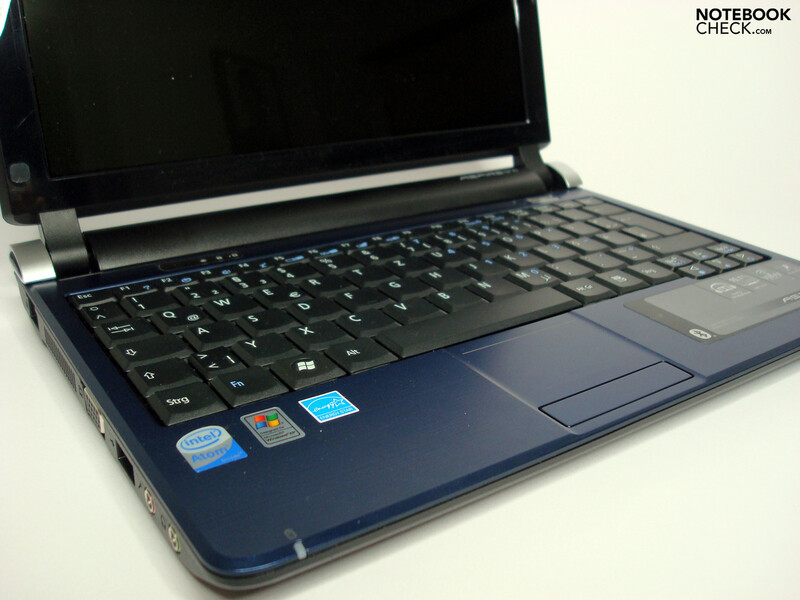 Our Aspire One D250 contains the usual Intel Atom N270 CPU, Intel GMA 950 chipset graphics and Windows XP Home operating system - 1 GB DDR2 RAM, a 160GB Western Digital harddisk and the already discussed 10.1” display complete the pack. This combination has very little room for improved performance and our system smoothly joins the rank of tested Netbooks. The mini-notebook has enough performance potential for familiar applications like Office, Browser or iTunes. It plays even H.264 videos at 853x354 resolution smoothly. The N270 CPU converted our five test songs from MP3 to AAC format in 5:31 min and reached 4.3 - 4.9x speed. 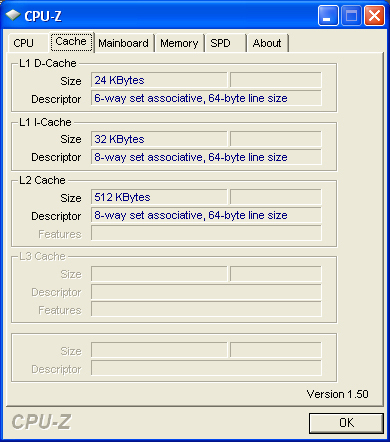 System slows down very fast when multiple CPU intensive tasks run simultaneously. Running virus scan and converting of a few files at the same time slows down the system and it stops responding to input. 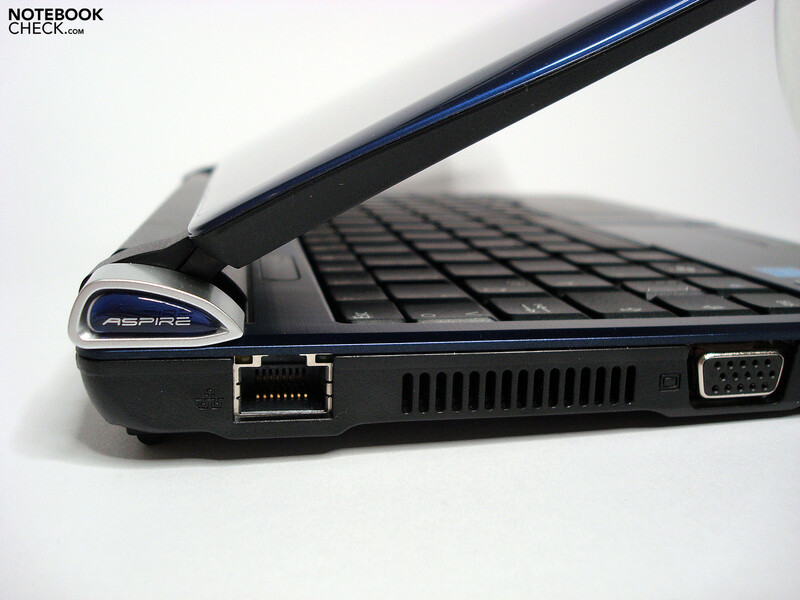 With up to 27 MB/s, USB ports provide a respectable data transfer rate. External hard disks and USB sticks are utilized adequately without bottlenecks. The 160 GB Western Digital SATA harddisk is considerably faster and with its 51.1 MB/s average transfer rate on par with this class. If you want to upgrade RAM, there is only one RAM slot and the included 1 GB RAM stick must be replaced with a 2 GB RAM stick. 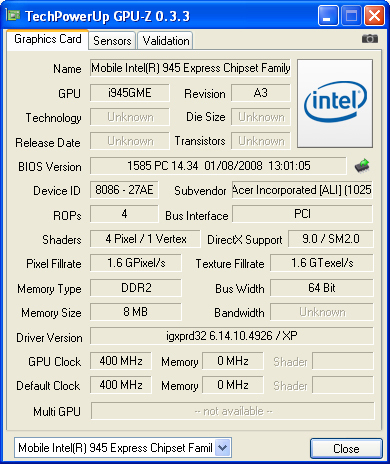 Some applications run slightly better and sometimes waiting times are reduced. The Aspire One D250 is a very pleasant mobile device with a measured noise of 29.5 dB(A) to maximum 33.1 dB(A) and has an unnoticeable fan behavior. 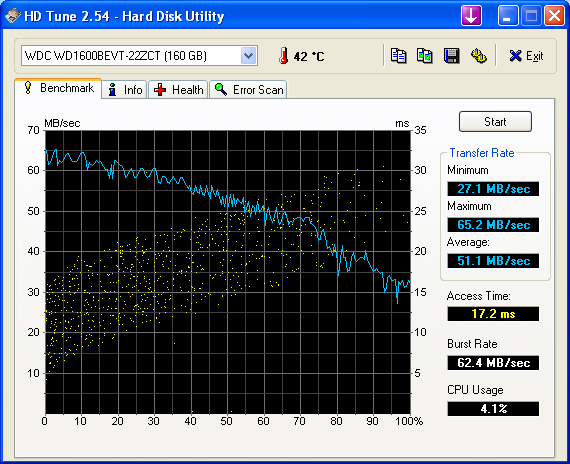 With 30.1 dB(A) noise level, even the hard disk is hardly noticeable. The pleasant fan behavior has negative effects on heating and reaches unpleasant levels with maximum 48.9 oC at the bottom of the case. So, it is not longer usable on the laps without becoming unbearable. The temperature is better on the upper sides with only 41.4 oC around keyboard and palm rest areas. 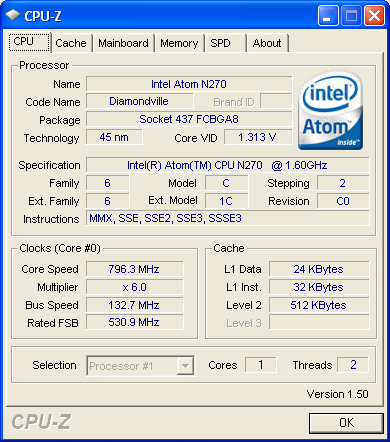 (-) The average temperature for the upper side under maximal load is 38.3 °C / 101 F, compared to the average of 29.8 °C / 86 F for the devices in the class Netbook. (±) The maximum temperature on the upper side is 41.3 °C / 106 F, compared to the average of 33 °C / 91 F, ranging from 21.6 to 53.2 °C for the class Netbook. (-) The average temperature of the palmrest area of similar devices was 29.3 °C / 84.7 F (-9.8 °C / -17.7 F). The front located, downward inclining speakers have a practical volume range. The high and bass tones are poor, and alternative listening devices are required to overcome background noise. Even with average MP3 player headphones, enormous increase in sound quality is achieved. Our model has the lighter 3-Cell, 24Wh battery. Acer plans to offer two alternative 6-Cell batteries with 48 Wh and 57 Wh. Even when the capacity is low, we reached handsome 235 min battery life in Battery Eater Readers Test ( maximum possible run time ). 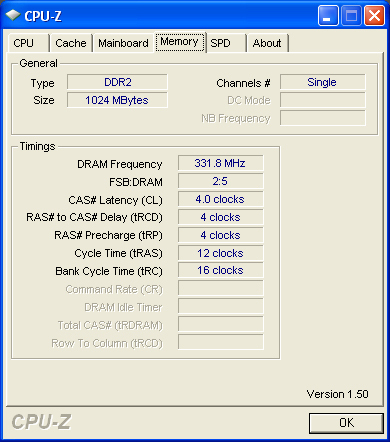 The 5.6W power draw is responsible for this result and the relative good runtime. 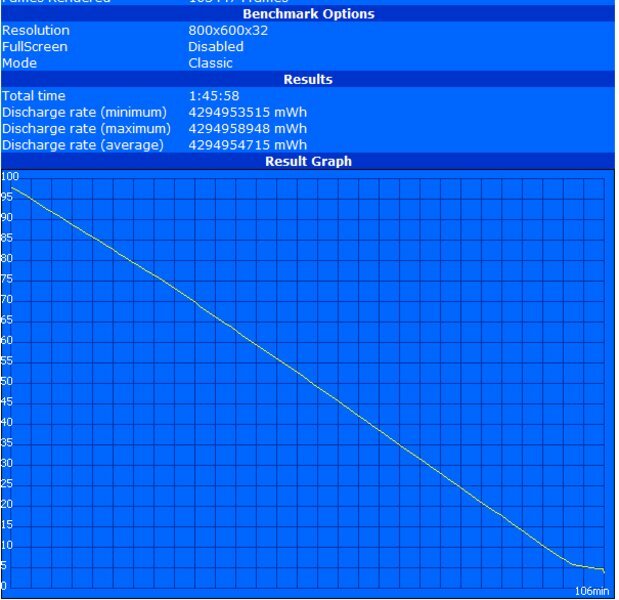 Acer implemented efficient power control mechanisms and in our practical W-LAN surf test 168 min runtime was possible. Under full load, with BatteryEater Classic test (minimum run time with full brightness, W-LAN, BT on ), the mini-notebook draws up to 17.1 W and achieves only 106 min run time. Currently the Aspire One D250 we tested is not available in this configuration and the results can not be fully transmitted to available models with Intel Atom N280 CPU and 6-cell battery. While CPU and battery configuration effects runtime, performance, heating and noise characteristics, we can draw conclusions on port location, case and display quality without any further consideration. 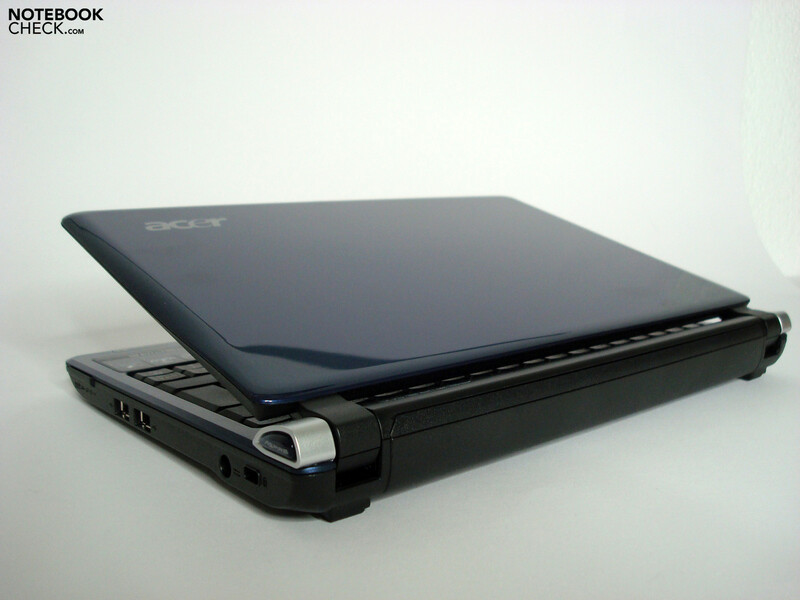 Since it has no significant effects on usability, since the slightly modified port positioning does not bring any improvements compared to the Aspire One D150. The card reader has changed sides, the VGA port comes a little bit more to the front, but the more frequently used USB and Audio ports have remained in the same awkward places. The glossy display offers less brightness and other characteristics do not offer any improvement. 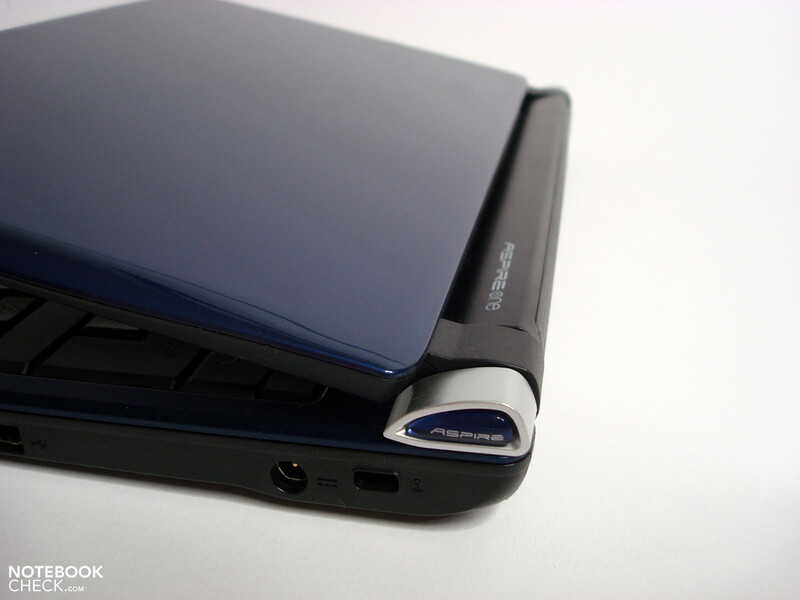 Essentially due to the glossy display, even the Aspire One D150 had limited suitability for mobile work or unfavorable lighting. Compared to Aspire One D150 with 3-cell battery, weight of Aspire One D250 with 3-Cell battery has been reduced by 100 grams. 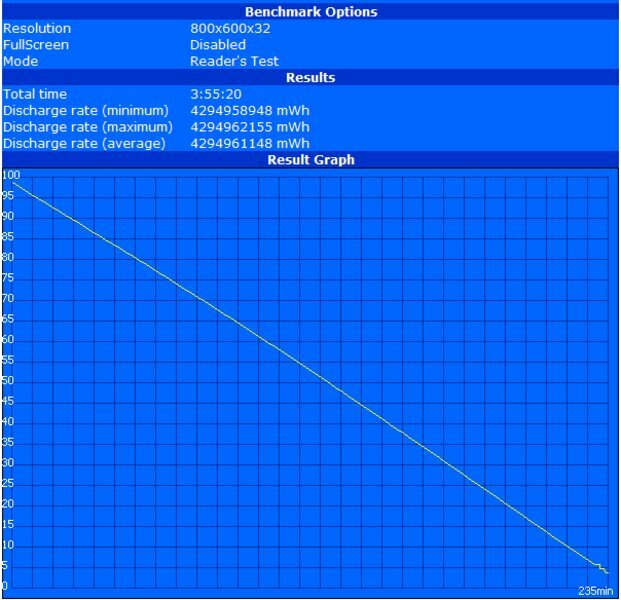 The wattage was also reduced in some scenarios and even with a 24Wh battery almost 4 hours are accomplished. One of the results is the smaller heat generation which has lead to a more bearable temperature on the bottom of the case. The pleasant noise characteristic in the predecessor has been kept the same. Unfortunately, an optional but currently unavailable competitive differentiator, the integrated UMTS-modem, is missing. 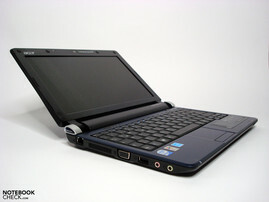 This would allow the mini-notebook to rise above the competitors and would be an be an important distinctive feature. 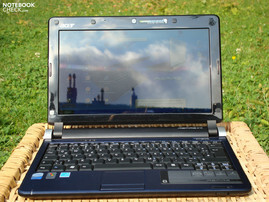 The Aspire One D250 is the successor of the Aspire One D150. The handy W-LAN switch is slightly stiff. While the upper surface temperatures are under control sometimes they become unpleasant on the bottom of the case. Very low system noise give a pleasant work environment. Solid surfaces in "inner work area". Audioports would be better located in front. We are already familiar with the small design elements like the Aspire logo. ...and follow the current slimline trend. … is very strong. Especially Asus Eee PC 1000H and Samsung NC10 offer overall a more balanced design and good properties for mobile work.